Man, in his passage of life on Earth functions in a situation of two natures: one is external superficial skin-deep and the other is the internal enclosed situation of his innermost movements, giving birth to his special desires as well as, however, special fears. Man attempts to keep these in a secret state, for fear others should learn his introverted thought forms of desires, that also determine for him a condition of cowardice and audacity, as well as of fear with hatred. Nowadays man’s thought has reached a level of great scientific achievements. However, these achievements have now begun to show us their real aspect. The beliefs of the title-holders shape in them a satisfaction which they clamour outward, wanting to persuade also those who have no titles that they have succeeded in what they were researching and that based on their revelations the whole world will live a beautiful life. But no one has contemplated what in fact is beautiful and what is ugly. If the beautiful is a superficial quest for the moment, with a view to hiding from our innermost fears, then it is the judgement of the unconscious that calls it ‘beautiful’. Let us consider here how much publicity and what prizes have been awarded to those somebodies whom they have characterized as ‘great’ persons. But we also say ‘of great age’ for a person who has spent many years of life here. “He was great in years” they say of an old person who leaves life here, and, “he is great” they also say about someone who happened to invent something and present it to society as a great achievement through which mankind will be able to enjoy success. But in the case of him who passed through many years of life here, nobody was concerned to learn what he had to deal with internally and how much endurance was needed for him to overcome the one thing that gave rise to the next, resulting in his whole life being ‘decorated’ with those great unpleasant events that he faced every day. If we come a little deeper inward, to man’s biosynthesis, with his biological constitution and co-elementation, we will see that in the course of his every day he comes across unfavourable things and a lack of facilitations. People nevertheless are bound to the superficial skin-deep situation and formed their though in such a way as to stabilize the meaning of life on the skin-deep. And they have not devoted even the least time to reflect a little on their internal state, which they have to deal with every day and that impels them to extroverted references against others. This is something we will notice in the urge to be dependent and to become a partisan that a person seeks in the throes of his dissatisfaction with his inner ministration and thus makes him subject himself to diverse tyrannies. What we can observe in this becoming a follower is that we also lose the relation of feeling of life and its meaning, dedicating to a superficial skin-depth as well as to the creation of the unconscious, the hatred, the differences and all that derives from them. However, that exists mostly and is shaped by the wish of the subject person (i.e. the unknown one) that he should be offered – while he does not offer – what is fitting, that is the meaning of a life of sociabilization. All this forms a complexibility in the biological and biochemical order of the individual. Thence set out all the unpleasant outcomes of his life. If we come to his biological techno-composition and its direct relation to the ethereal biochemistry we will notice that everything in man is outlined and has its expression of life based on the conception that takes place in the special gland called the epiphysis. An extension of the epiphysis is the ethereal Imis gland, which constitutes an antenna of reception that, based on its capability, captures elementation messages from the atmosphere and renders them as a message report within the organic order, relative to every situation of movement of the person during his course of life. All the elementational states of an individual are supplied by the energy-ethereal conception of frequencies from the Imis gland, to enter subsequently into the organic community, which classes them in the regulation of the supplying operation of the cerebellum, and thence to form transmissions of messages to the diverse areas of the organism such as the visceral or the hormonal. These transmissions are executed by means of the system of the neuro-transmitters. This is how we find ourselves receiving energy-atmospheric messages, which we are incited to realise, in the belief that thus we complete the beauty or restoration of our life. We never however examined how it all functions, how and why the diverse searches within us are energized and how we submit to an illusory picture and are bound to experience it ourselves too. All of this is man’s organicity. The specialists on Earth have attained various achievements, but they have not discovered the special point of organic state which I call the controlling gland, in order with its aid to see whether the organicity functions in the permitted mechanistic contracting and dilating state of time measurement of those elements capable of giving us the equilibrating balance of plus and minus. I believe that if we do not pass into some perception of the meaning of life here, we will not be able to make correct evaluations of the results of our every choice. That is more or less how we ended up as we are today. In fact while we want to comprehend the language we speak and be comprehensible, in the end absolute incomprehensibility prevails. The main reason is that each of us speaks with the impulsive wish to influence others, to impose upon them and turn them into our partisans, a function that comes under the supply of the hormonal. It may be seen both in scientists as in politicians. The politician uses imperative speech, bringing about binding and submission to guidance. Politics are consequently a play on words entering into people and, based on their ignorance of the meaning of life, politics binds them into becoming followers. They believe moreover that the politicians will find something they themselves lack and that in this way they too will be restored to the meaning of life. However, they do not check if it is indeed so, the reason being that as a person grows older, based on all the sub-functions he has in him, he needs to develop a relationship with others. In order that in his moments of need, also the fear he feels should be redeemed. There is however no way in which a person’s function is restored, if he does not first perceive in himself what the meaning is of his life and of his presence in the space in which he finds himself. This is the cause of the irregularity of relations of communication among people. But we humans also resort to another sort of naming: ‘democracy’. I really do wonder whether they have understood what is thus named. When we say democracy, we mean that the demos (Ancient Greek ‘the commonalty’, Modern Greek ‘the municipality’) administers the area in which citizens dwell, and administers justice. But we mean administration, not corrupt speech and promises – promises that I could also characterize as philandering… And since they hold to a mistaken interpretation of the term ‘democracy’, is it not natural that all those who express it and mention it should function wrongly? It is these errors that finally bring about the state of Babel, where each is presented as politically representing himself in order to politicize others under him. 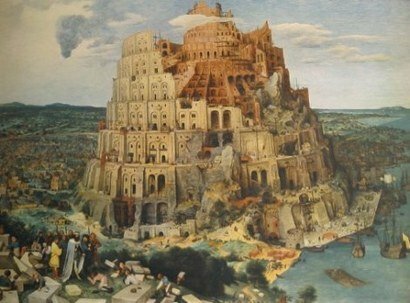 Babel, where each is presented as politically representing himself in order to politicize others under him. We could say on the basis of all this that human societies neither have known nor will know that natural composite that co-elements life and also nurtures the future of essence. And if they are condemned to a state of non-communication of Babel, it is because from the moment of birth a person comes under a tradition of deformity of double-talk: of the linguistic function of the secret inner desires of his parents – who minister to the cunning that could put them in a position of power, which is money, recognition and the rest —and on the other hand comes under the language of the educational course into which he is initiated. When in this way a person enters such an education, he cannot distinguish the essential values. For one of the languages develops his skin-deep element and the other the imperative to satisfy it. The person finds himself in the end in submission to the one-sided state of the skin-deep, which is none but the most fertile element of illusion. And he thus ends up having no right to anything in his next steps in the hereafter.